The University of Minnesota's Board of Regents has a big job ahead as the search begins for a new president. 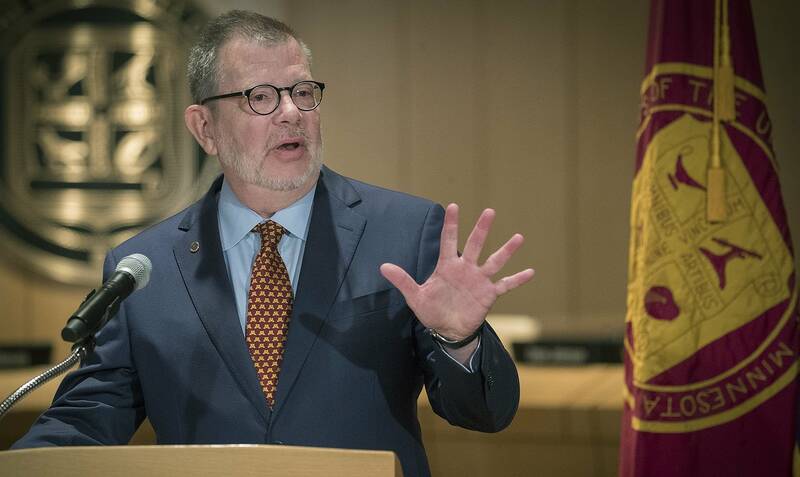 Eric Kaler will retire in 11 months, and the board has to find a replacement that will take over the university at a time when higher education is in flux. The Regents agreed to pay Storbeck, Pimentel & Associates $200,000 at a special meeting. Alberto Pimentel explained what his firm has learned over hundreds of searches. "The best candidates rarely apply, they have to be coaxed into it." The school set up a website for the search. People have until next Wednesday to submit nominations to the committee which will include regents, faculty, students, staff, alumni, benefactors and other members of the broader University of Minnesota community. The school is also accepting community input on the U's president search website. The search firm estimates the process, once the search committee is in place, will take about three and a half months. Members of search committee should be announced in early September. Regent Abdul Omari joked "just find somebody that can walk on water," but he would like to see a candidate who understands the classroom, puts students first and understands the state's history. Regent Randy Simonson, from Worthington, wants a president who knows Minnesota agriculture and is able to make connections to a growingly diverse rural Minnesota. Regent Darrin Rosha wants a candidate who sees the position as public service and isn't looking for a big salary. And student leaders want someone who supports students and issues importannt to the student body. "Someone who has a very student-centric opinion on how they need to govern our institution, somebody who prioritizes a lot of the topics that students collectively have been working to advocate for," said Mina Kian, the incoming vice president for the Minnesota Student Association. She pointed to topics like tuition, sexual violence on campus and student mental health. Kian said student input should be a key part of the search. "It's critical for students to be engaged at every single step of that selection process, and the selection process as a whole to be transparent to the student body," she said. "Because at the end of the day, we are an education institution, and it's important that the individuals that are being education are being engaged in the selection process for the individual that will govern our institution"
Cherrene Horazuk is the president of AFSCME Local 3800, the clerical workers union at the school, and works as an administrative assistant at the Humphrey School. She wants a president who supports shared governance. "We hope that staff will actually be a part of this process. It's not something we are generally consulted with, especially for frontline staff," she said. Joseph Konstan, the head of the faculty senate, says a faculty senate executive committee is most interested in a president who has taught and had some leadership role at an institution like the University of Minnesota. Konstan says the committee was split on whether a former business leader would be a good fit, and generally they're supportive of people who've worked in staff or administrative positions at schools. "There was a fourth category that very honestly worried almost all of the faculty, and those were political leaders," he said. "I think we have a lot of concern that even though there are examples of political leaders who have been successful, that we don't think that's probably the right fit for this university of this state."